Some coaches do not want parents or swimmers to be able to view the details of workouts, at least for certain rosters or squads. If you are one of them, you have the ability to hide workout details for one or more rosters/squads. In the SwimOffice side menu, click Coaching Tools > Practice Calendar. Click Settings in the upper right. 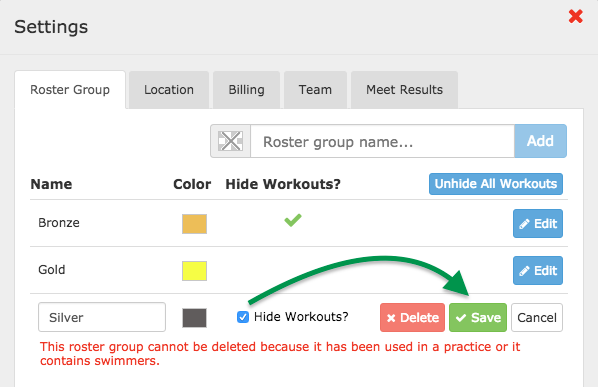 Either click Hide All Workouts if you don't want any roster/squad to see workout details, or Edit an individual roster/squad, check Hide Workouts? and click Save. 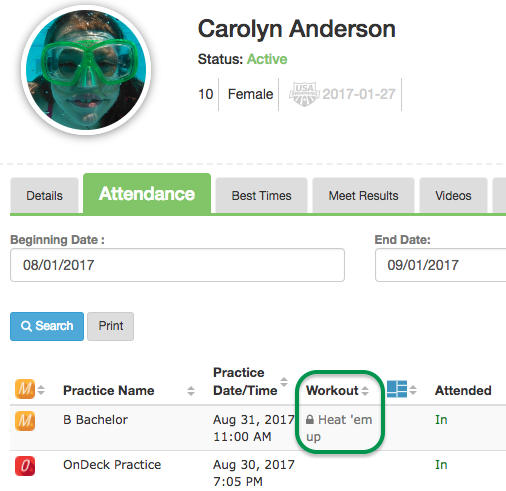 Now when a parent with a swimmer in one of those rosters/squads logs in to SwimOffice, when they view attendance for a swimmer in one of those hidden rosters/squads, the workout names will have a lock by them and clicking them will do nothing. Likewise, in OnDeck, tapping a specific attendance session will no longer show workout details. Instead, they will see the message "Workout details have been hidden from your roster group!" When they tap the Workouts tab, they will not see any workouts at all that are hidden.